From Kirkby Stephen Station turn immediately left and walk along the main road. After 1/4 mile turn left towards Sedbergh and after 100m turn left again along a minor road towards Low House. Just before Moor End Farm turn right through a gate onto open pasture. 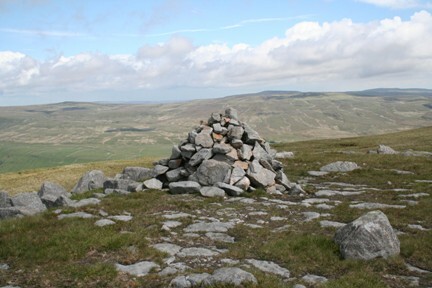 There is a track which becomes a very faint path but generally progress in a southerly direction for a good mile or so with the objective of Wild Boar Fell in view. Upon reaching Tommy Road, in fact a minor road, turn left and proceed along the tarmac for 1/4 mile before branching out right over Wharton Fell with the summit of Little Fell in sight. The grassy path quickly meets a wall on the left hand side passing a barn. 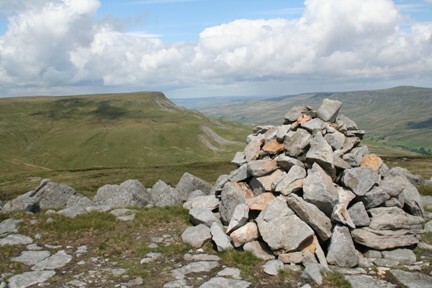 Pass the summit cairn of Little Fell [559m] and maintain the same direction now with Wild Boar Fell in sight. The path drops down slightly to meet a wall and then increases in steepness as the summit is reached. 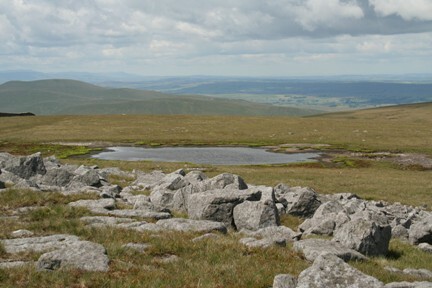 This is in fact a plateau with dramatic drops and views across Mallerstang on one side. 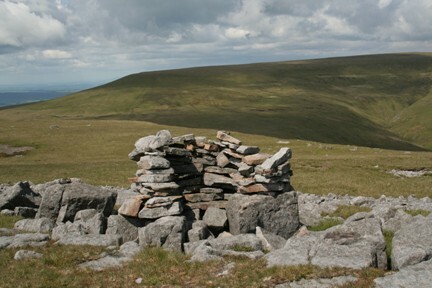 The Wild Boar [708m] summit cairn proper demands a slight deviation to the right where there are good views over to the Howgills. However, arguably the views into the Mallerstang Valley are more dramatic. Leaving the summit cairn of Swarth the grassy path descends initially across open ground following the ridge converging with the fence on the right and eventually crossing a fence. Now on the other side of the fence looking into Grisedale the path leaves the fence for a short while at a slight bend in the ridge to converge again a short while later. Continue long the crest of the hill with the fence or wall on the left passing a metal bridleway gate. Still with the wall on the left proceed for a further 1/2 mile across Grisedale Common to turn left through a gate. From this point descend quickly across South Lunds Pasture to Grisedale Crossing, a railway footbridge once used by the children from Grisedale on their journey to school. Crossing the railway line walk along the farm access track and thence to the road. Turn right and proceed along the road for 1/2 mile to reach the Moorcock Inn.